Step into a mind-bending puzzle with this new VR puzzle adventure. 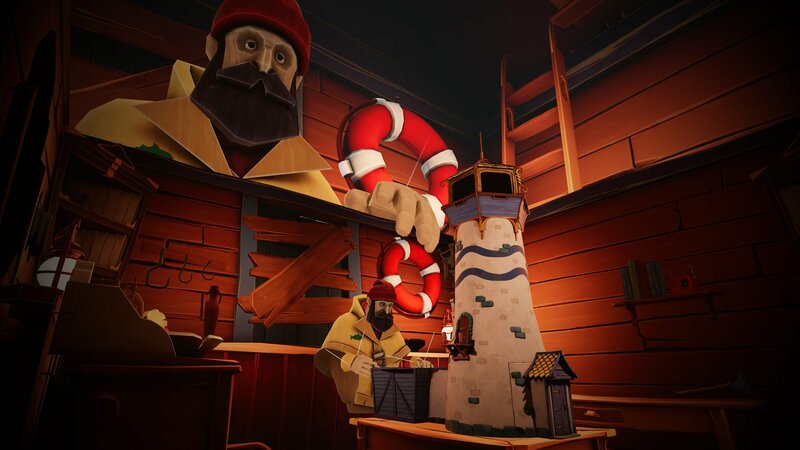 Developed by Innerspace VR and published by Vertigo Games, A Fisherman’s Tale is a mind-bending tale of an infinitely repeating world in which the player can team up with themselves to solve puzzles, unlock secrets and explore a beautifully rendered environment. Physics aren’t quite right here, and the items around you can quickly become the solution to your next puzzle. Explore the room, collect items, combine them, and toss them around in this beautifully created and immersive experience. The main gimmick in A Fisherman’s Tale is the ability to interact with the world by adding items to it. Set on a table in the midst of your cabin is a small recreation of the cabin and the lighthouse that the fisherman resides in. Your goal—to get to the top of the lighthouse and activate it—quickly becomes more difficult as new puzzles arise that you’ll need to solve. The replica of your cabin isn’t any normal replica, though. Instead, it’s a mind-bending warp that allows you to interact directly with a smaller version of yourself, giving you the option to add items to the world, changing their size and more. It’s a quirky looking adventure that’s now available on PlayStation VR, Oculus Rift, HTC Vive and even Windows Mixed Reality headsets. You can learn more about A Fisherman’s Tale by heading over to the official Steam page, where you can purchase the game during a special launch sale. You can also head to the game’s official website, where you’ll find more information, including media, trailers and other goodies about Vertigo Games’ latest hit. Virtual reality continues to evolve as new titles are released, and this side of the industry has come a long way from the Vive and Rift’s original release. It will be intriguing to see how other titles take advantage of the immersive nature of virtual reality. In other news, make sure you check out our review of the Resident Evil 2 remake, which releases later this week.